I don’t own a Cambridge Satchel. Shocker. But I am tempted now Vivienne Westwood is involved. What draws me to this collaboration, Westwood’s second, is her signature squiggle print taken from her Autumn/Winter 1981 collection, Pirate. The second thing I like is the pale tan buckles which replicate the ones used on Westwood’s iconic pirate boots. I’m a sucker for a print and clashing colours. 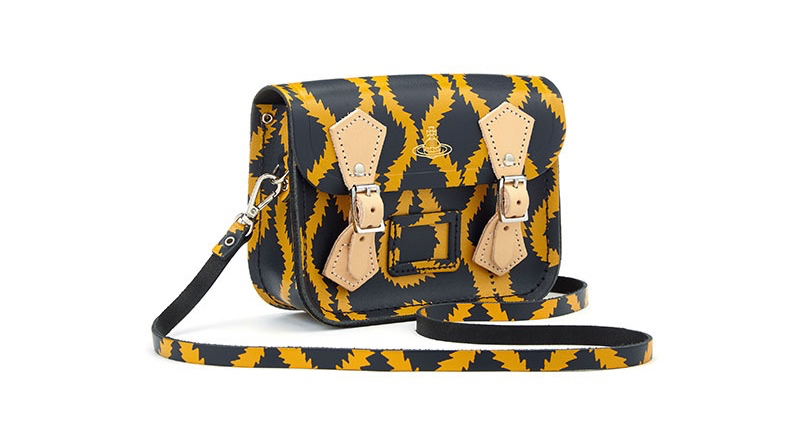 There are three colours in the range but my favourite has to be the Navy/Yellow Squiggle Tiny Satchel. Mainly because this is the only way I can wear mustard despite the fact that I love it. I also quite like the impracticability of carrying the tiny satchel as a clutch.